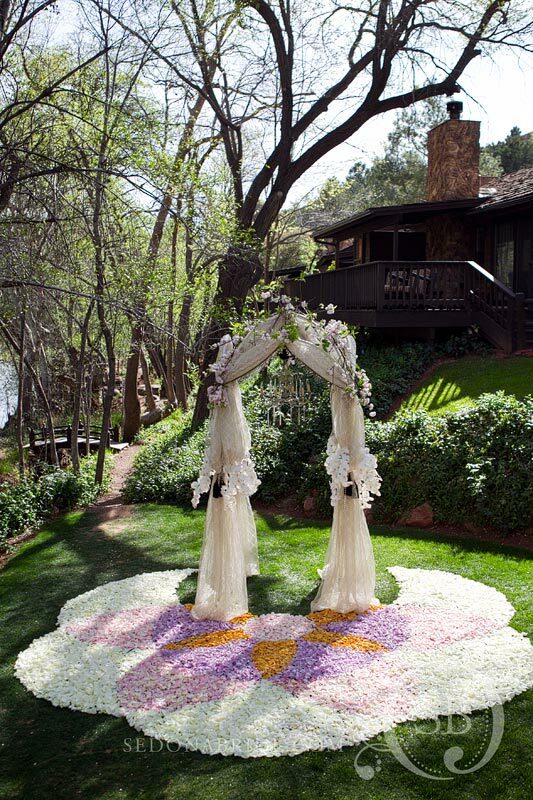 Since designing our first piece over four years ago at L’Auberge de Sedona, Events By Show Stoppers has become known across the country for our intricately patterned rose petal carpets. Read a multi page editorial about our work in the preeminent floral industry publication, Florists’ Review, published in 80 countries around the world. We hope you enjoy this galley of a few of our favorites. 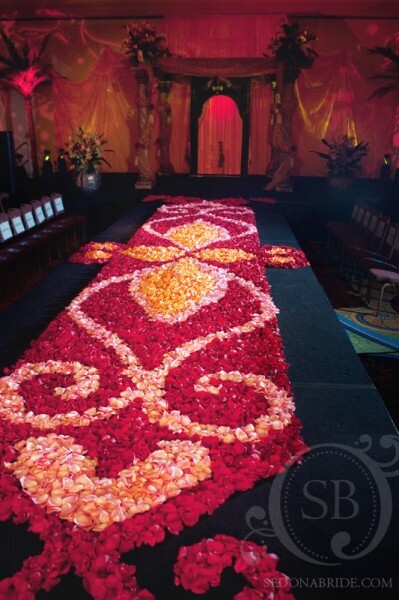 You will have a great time viewing the installation of one of our rose petal carpets at the link we provided below. 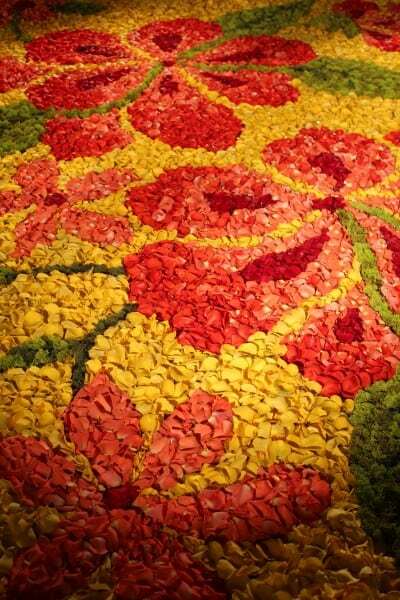 VIEW A TIME LAPSE OF A ROSE PETAL CARPET INSTALLATION HERE! 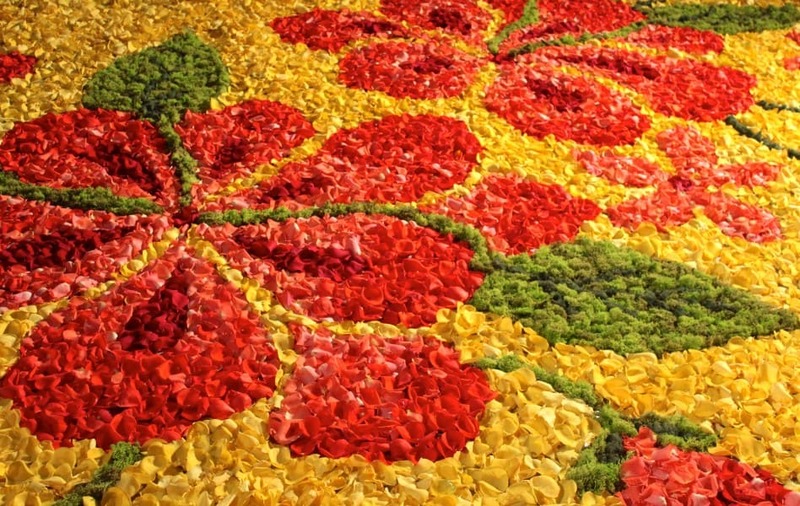 One of our more recent carpets, this piece was inspired by a tropical flower called heliconia. 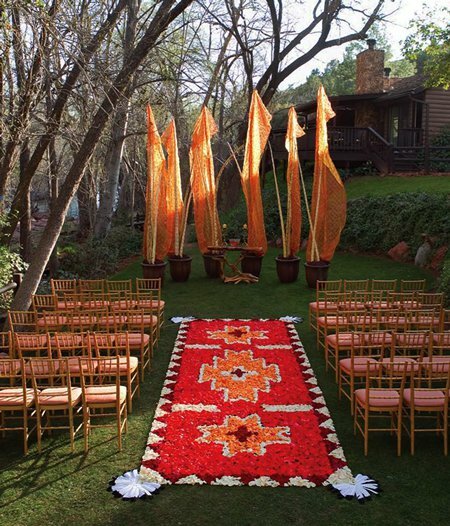 A traditional Navajo pattern was the theme of this piece that is currently featured with a full-page image in Grace Ormonde Wedding Style Magazine. 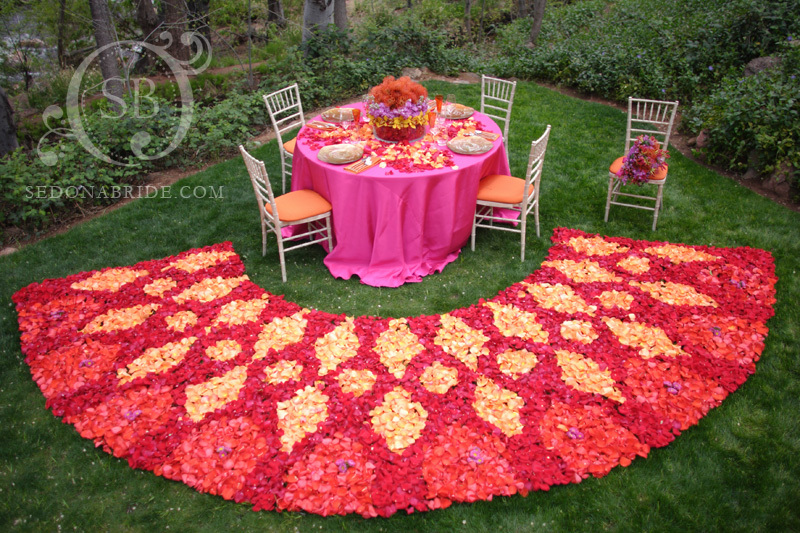 This colorful design was created for a Phoenix Bride And Groom Magazine Photo shoot. The piece was inspired by an Egyptian collar seen in an old classic movie. 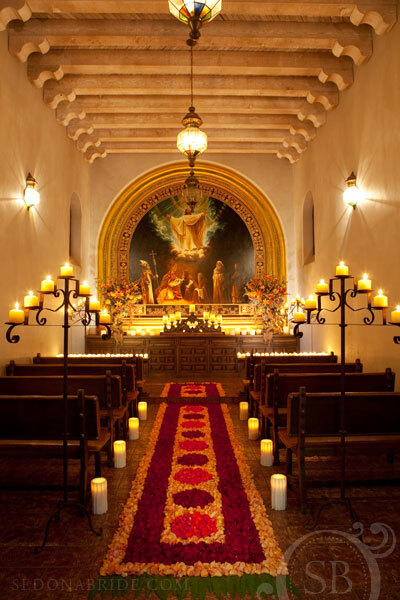 Many of our draping techniques, lighting effects, sets, props and concepts are inspired by our love of old classic movies, particularly classic biblical movies and film noir. The artists at Show Stoppers draw upon various sources of inspiration to create just the right effect and to develop new and exciting innovations. 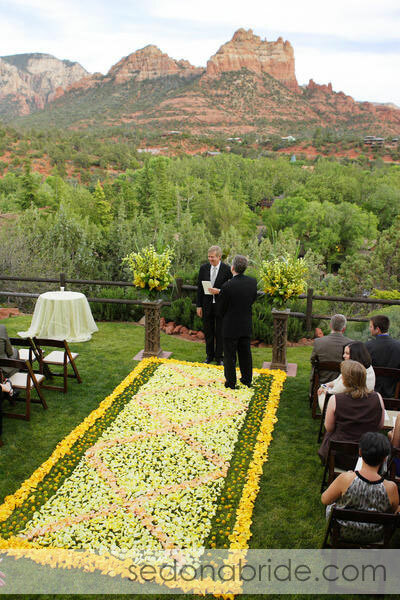 The Chapel at Tlaquepaque in Sedona, Arizona was the setting for this lovely carpet. 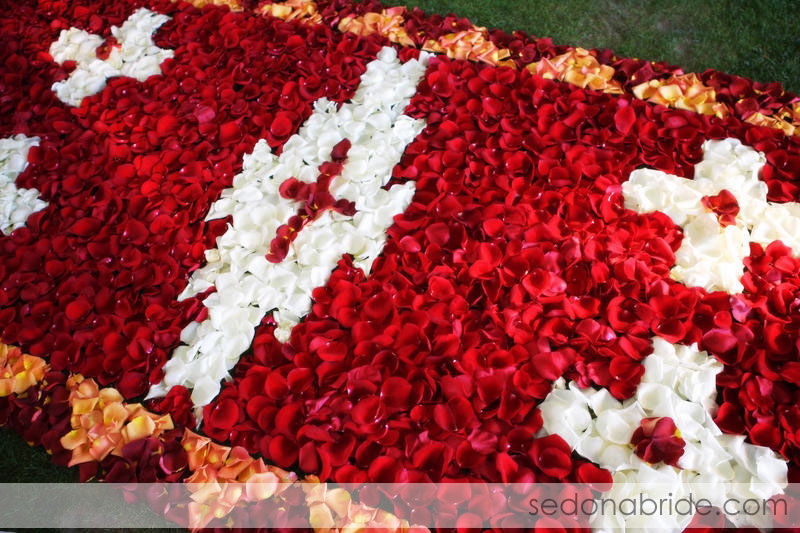 Existing patterns in the tile were used as a simple template to lay down the petals. Fern was used as fringe at the ends of the rug. 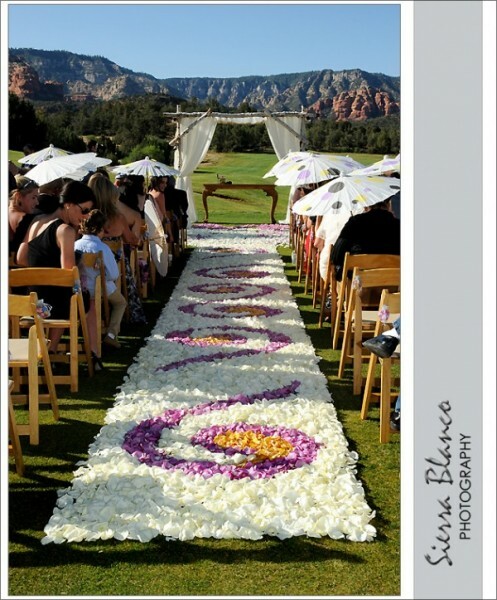 This image by Sedona Bride Photographers later became one of the most beautiful covers for Arizona’s Finest Wedding Sites and Services Magazine. 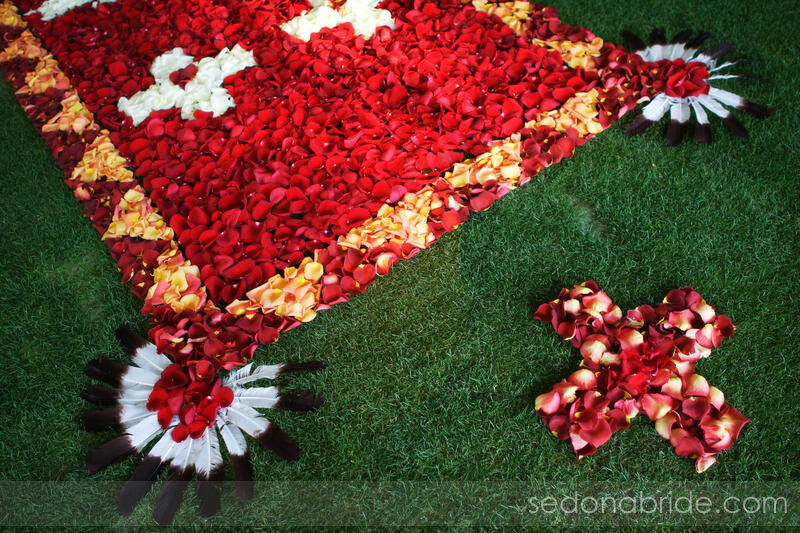 One of our first rose petal carpets was this green and yellow themed display. It remains one of our favorites. 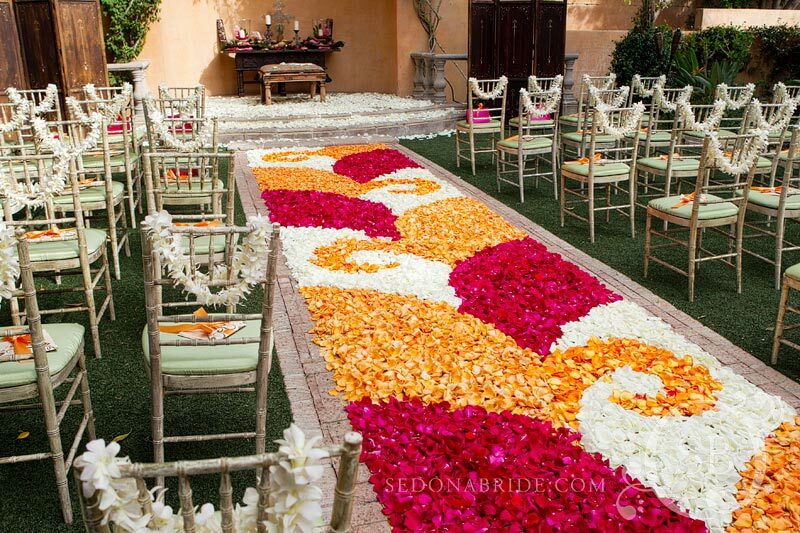 Rose petal carpets can be designed in endless patterns and configurations or just a simple, dense path. Many patterns are possible. Native American designs are popular with visitors to Arizona. The corners of this Native American design were decorated with eagle feathers that mimic Indian feather bonnets. 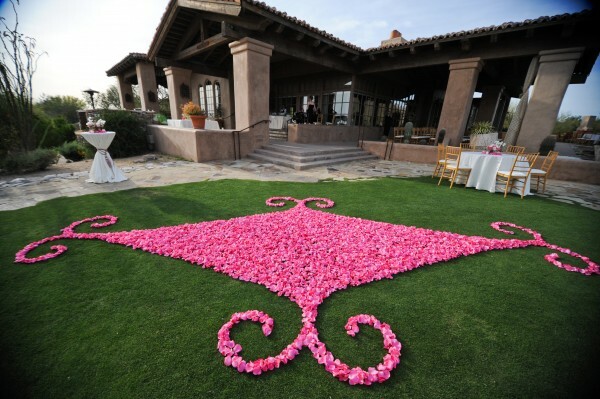 This design was quite effective as guests entered this wedding reception. 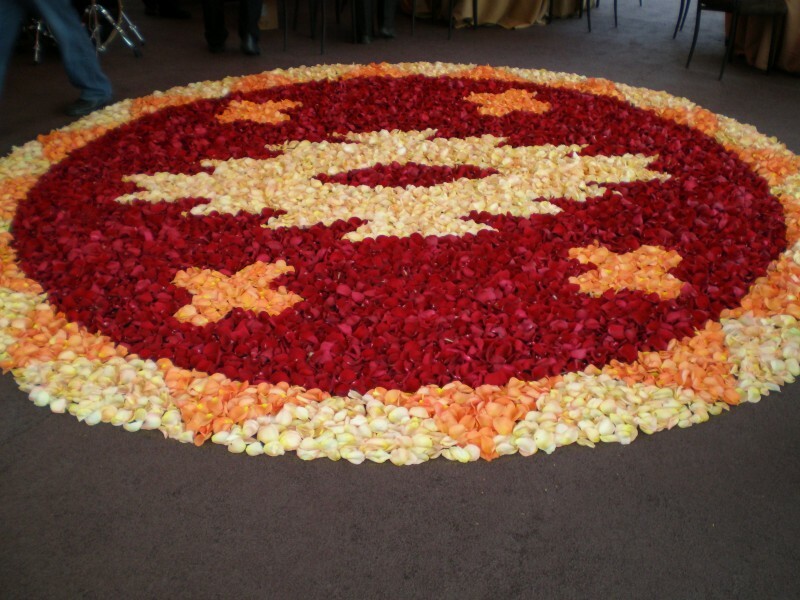 Rose petal carpets can be designed in any shape. This round design was the center of attraction in the dining tent at a birthday celebration for the matriarch of one of the world’s major chocolate empires. This design was for the grand opening of Wildflower Linens. 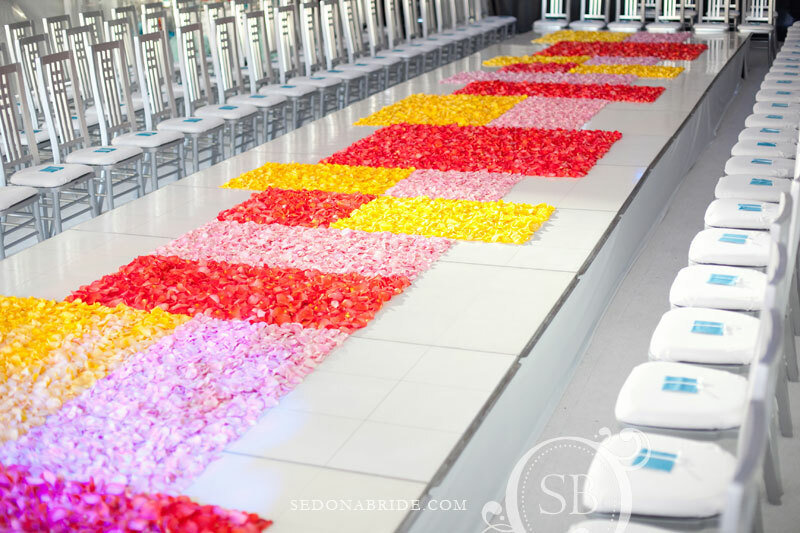 The design was for a fashion-show runway and was inspired by the retro look of a Frank Lloyd Wright stained glass window. 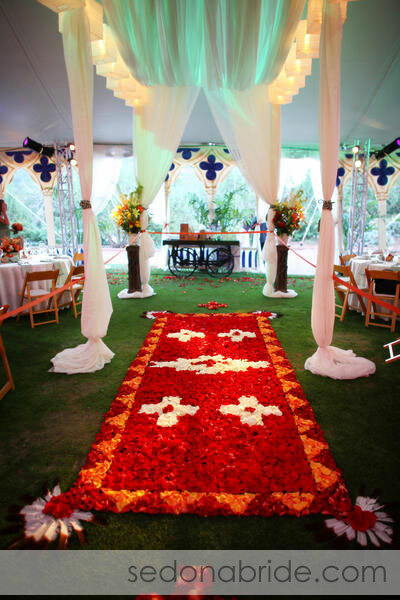 One of our favorite designs is this geometrically designed carpet installed for a photo shoot that was featured in Arizona’s Finest Wedding Sites And Services Magazine. 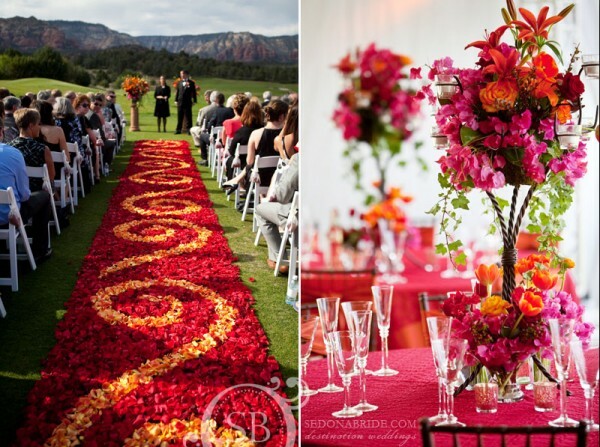 The color scheme of this particular carpet is one of our favorites. 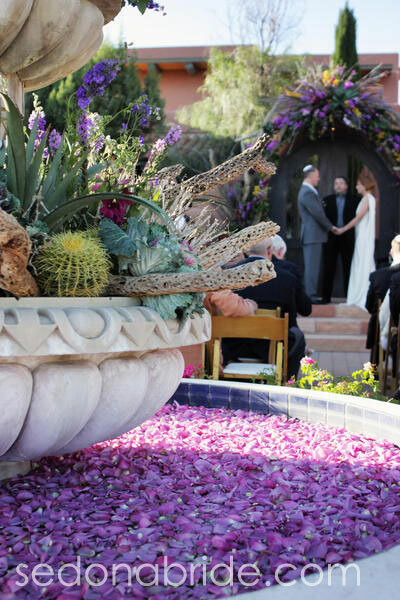 We also love the intersecting circles that mimic the petals of a giant flower. Solid colored carpets can be quite effective depending on the shape, design and background color. 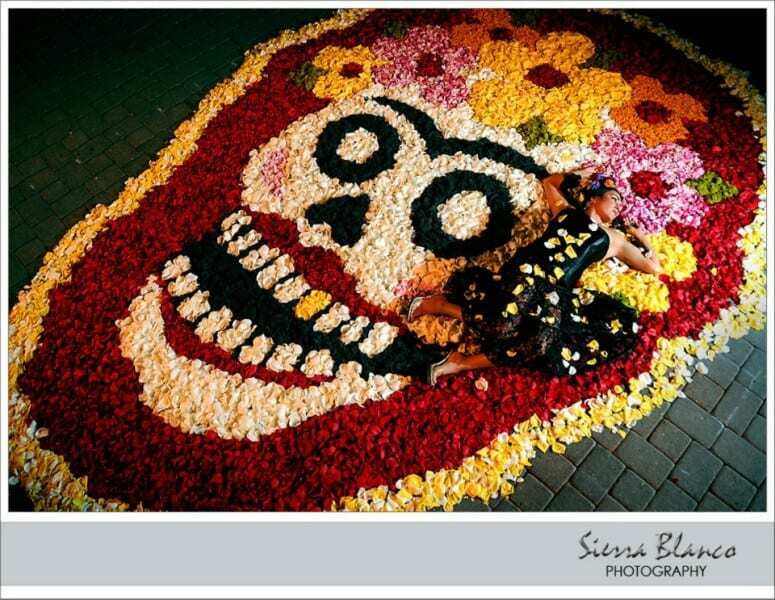 This exquisite carpet had flowing curves that gave movement to the piece. One of our most elaborate designs, Show Stoppers created this exquisite piece for the fashion show runway at the Dulhania Bazaar. 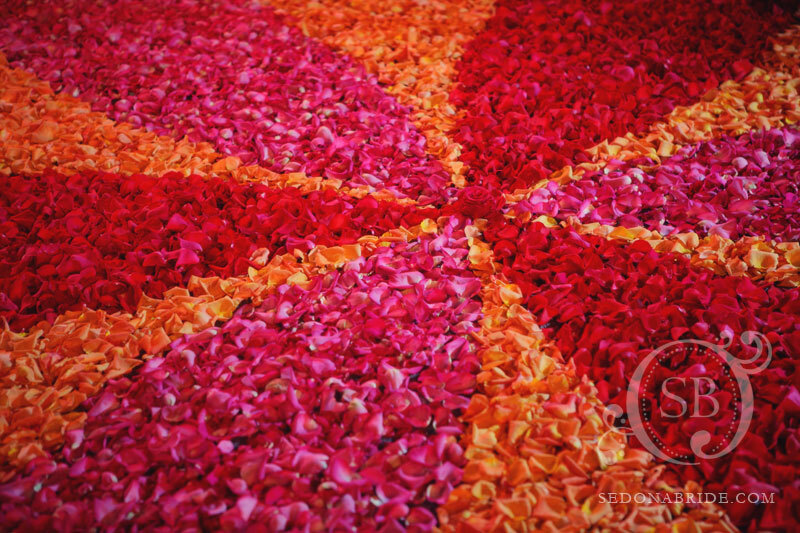 Rose petal carpets can be on the surface of water. Gardenias dotted the surface. The fragrance was hypnotic as guests sat along the edge. 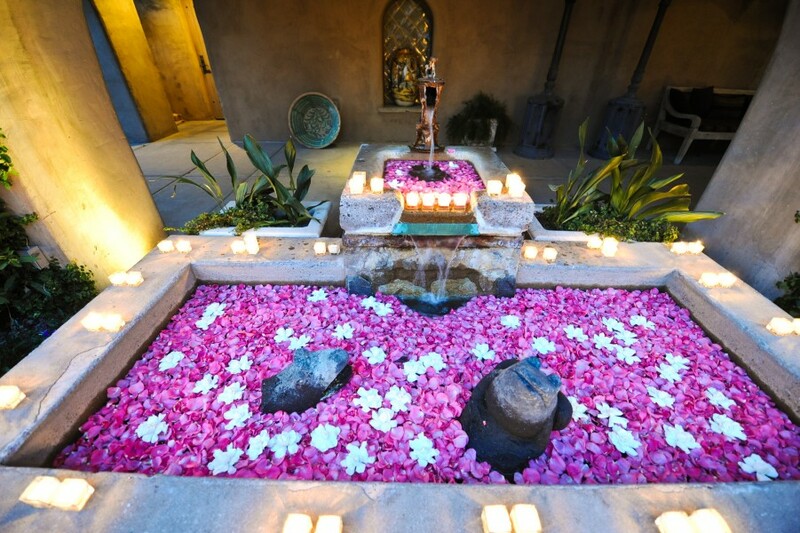 This beautiful fountain had a solid surface of lavender roses that looked like some kind of exotic algae. 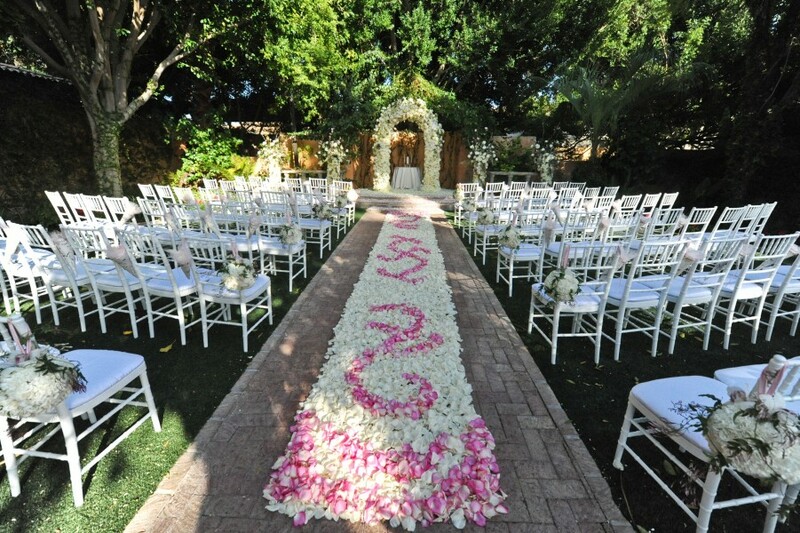 Notice how this rose petal carpet coordinates with the parasols! 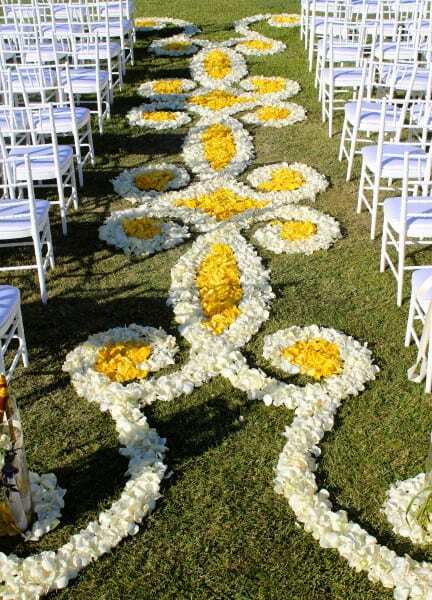 This bride wanted the same carpet design but in different colors. Both were beautiful. 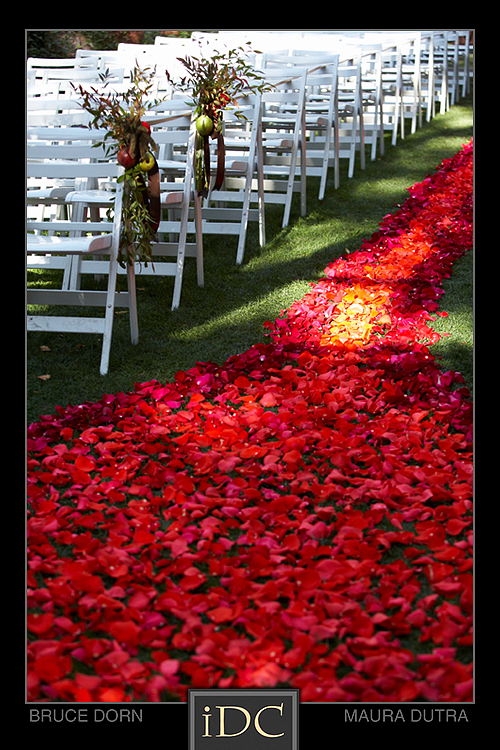 Contact Show Stoppers for information about our rose petal carpets.